All that gridlock isn't easy on the wallet either. Economic recovery apparently comes with one very unpleasant side effect: traffic. Eight years post-recession, more people are headed into work -- and roadways are getting clogged. 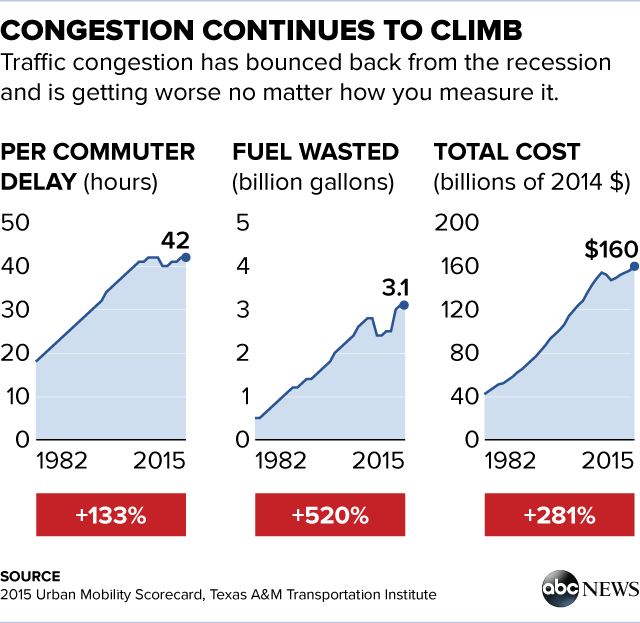 America’s drivers wasted 6.9 billion hours stuck in traffic in 2014, according to a study released today by the Texas A&M Transportation Institute(TTI) and INRIX. That’s 42 hours a year per rush-hour commuter on average. During the height of the recession, in 2009, we wasted 6.3 billion hours on the road. The pre-recession peak was around 6.6 billion hours, in 2007. “It appears that the economy-congestion linkage is as dependable as gravity,” the study declares. All that gridlock isn’t easy on the wallet. America blew through $160 billion in wasted time and fuel last year -- an average cost of $960 per typical motorist, according to the study. Delays cost commercial truckers even more. The average commuter guzzled an extra 19 gallons of fuel during traffic jams. Collectively, we wasted about 3 billion gallons of fuel thanks to traffic in 2014, the study found. Washington, D.C., tops the list of most congested cities, according to the study, followed by Los Angeles, San Francisco, New York and San Jose. In the nation’s capital, commuters spent an average of 82 hours of their year -- nearly 1 percent of their time -- bumper-to-bumper. In L.A., they spend about 80 hours; in New York, around 74. As you may have noticed, congestion builds through the week, going from bad on Monday to awful on Friday. 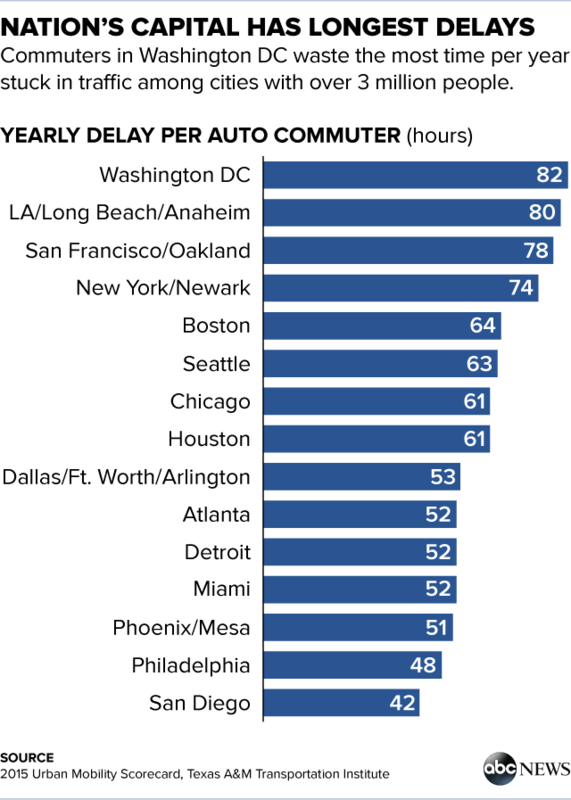 The average delay per commuter is more than twice what it was in the early 1980s. And according to Inrix and TTI, without “more assertive approaches on the project, program, and policy fronts,” congestion will likely only get worse. By 2020, TTI projects that the total nationwide delay time will grow to 8.3 billion hours -- an increase of 1.4 billion hours in just 5 years -- and congestion will cost $192 billion. Quickly towing crashed vehicles, synchronizing traffic lights, and improving road design can impact traffic time, according to the study. So can adding highway lanes and providing better public transit. And modifying workers’ schedules or allowing them to have flexible hours could even out traffic and reduce the rush-hour bottleneck.